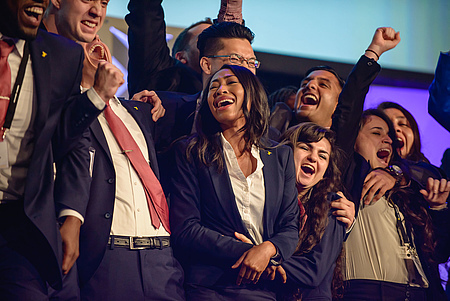 RIVERSIDE – After months of work and hours of practice, the La Sierra University Enactus team reaped its reward with a first-place win at the Enactus National Expo in St. Louis, Missouri. Approximately 20 La Sierra Enactus team members, led by a six-member presentation team, competed May 15-17 against 118 universities and colleges from around the United States. During the final round, La Sierra took first place with second place going to John Brown University, third place going to Flagler College, and Heritage University in fourth place. La Sierra will represent the United States during Enactus World Cup competitions in Toronto Sept. 28 – 30. This is the La Sierra team’s seventh national title during its 25-year history, an unprecedented string of national wins. The team last brought home the national trophy in 2007, going on to win the world cup that year in New York City. During competition, teams from each school give 24-minute, multi-media presentations on the impact of their school’s Enactus projects which aim to economically empower and sustain communities locally and in other parts of the globe through entrepreneurial endeavors. Panels of judges comprised of executives from America’s leading corporations decide winners during opening, semi-final and final rounds. • Mobile Fresh, a partner project with Family Service Association in Riverside involves use of a renovated Riverside Transit Agency commuter bus that functions as a mobile grocery store bringing reduced-rate fresh produce and dry goods to areas with few supermarkets. The team, which manages marketing and educational programming for the project, took the Mobile Fresh bus to 40 locations throughout the Riverside area. They achieved 1,800 customer transactions per month this school year with 3,824 people directly impacted. Customers saved up to 50 percent on food costs. • Enactus Field Station, Denkanikottai, India, where an Enactus Cow Bank micro-lending program started in 2013 has more than doubled the income of participating families who receive milk cows on loan from the team, sell milk, repay the loan and ultimately buy the cow while earning significantly higher income. The team has purchased and loaned 117 cows thus far. Cow Bank entrepreneurs have invested $154,740 into the local economy and none have defaulted on their loans. The field station last November also established a new micro-lending program involving sewing machines and a sewing school. Thirteen young women will complete the program in June, ready to earn additional income with their new skills. • Innovation Camp in California schools impacted 840 high school students with lessons in innovation and human-centered design. Since 2012, more than 3,500 students from Canada, Mexico, India, China and the United States have experienced the program, creating new ideas and prototypes. The team is also launching this spring a Riverside Water Project focused on the water crisis and a new program for the Family Justice Center Project that will provide financial literacy, training and employment assistance for victims of domestic violence. The business school is named after entrepreneurs and education philanthropists Tom and Vi Zapara who have supported the school and its Enactus teams for more than 20 years. This year, for the first time Tom Zapara, at age 93, attended the team’s national competition and had the opportunity to witness their first-place win. In a meeting with the team afterward he told them he believed he was divinely inspired by God to attend this competition. In addition, John Razzouk, La Sierra’s Sam Walton Faculty Fellow, an Enactus designation, was named Sam M. Walton Free Enterprise Fellow of the Year during the national expo. Two La Sierra Enactus students were also offered jobs by the Walmart corporation. Razzouk, a business school alum who as a student led the team to its 2007 national and world cup victories, shepherds the Enactus teams through their projects and competitions. “I was kind of speechless,” said Razzouk, describing his reaction when the team was announced national champion. “I was so proud. I felt kind of like a dad. We set out to prove what students are capable of,” and achieved that goal. The team has come close to nabbing the top spot several times during the past nine years, placing second in the nation last year, third in the nation in 2009, and landing among the top eight teams in 2010. Enactus, an international organization, has 533 universities and more than 16,800 students participating in its U.S. division. The organization began in 1975 as SIFE, or Students in Free Enterprise and changed its name in 2012 to Enactus. Darla Martin Tucker is Director of Public Relations for La Sierra University.